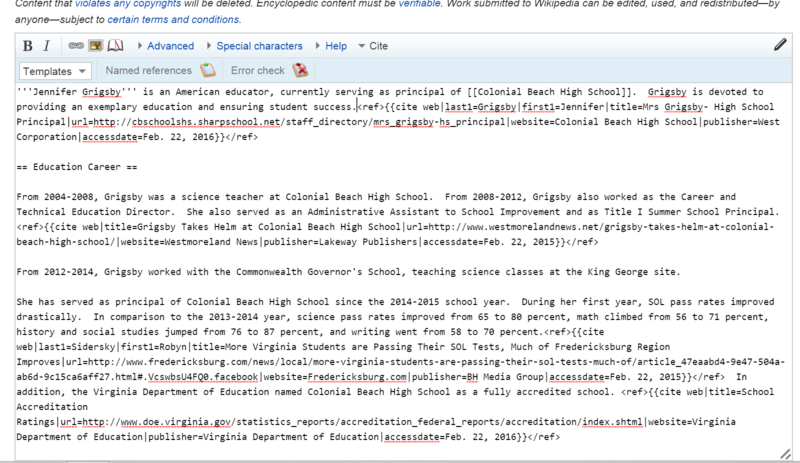 My first step was to set up a Wikipedia account and ease myself into the mechanics of editing. I first added some updates to some biographies, both of which appear to have stuck. I then decided to up the ante and attempt creating my own Wikipedia article. I asked a former teacher turned principal for permission, which she graciously granted, and began gathering some research and articles to ensure I could add credible citations. 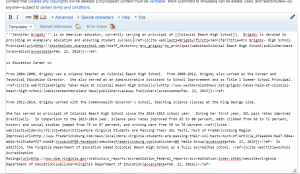 I then used the Wikipedia articles on creating a new page and formatting to begin creating an article. The raw input can be seen below. But almost immediately after publishing the article, I received a warning, which stated, “This article may meet Wikipedia’s criteria for speedy deletion as an article about a real person that does not credibly indicate the importance or significance of the subject.” I contested the speedy deletion and formally argued my point’s regarding my subject’s significance on the talk page, garnering a reply from another user, who asked. “What reliable sources do you have that indicate that these increases and changes are enough to make her notable at a national or global level?” I then began linking items in my article to established Wikipedia page, added more of my subject’s various awards, and added to my references list. Alas, to no avail. The next morning I checked my page and found the following announcement. “Sorry, this page was recently deleted (within the last 24 hours). The deletion and move log for the page are provided below for reference.” Interestingly, the user who deleted my page was not the same user who had been communicating with me on the talk page. I have heard that creating Wikipedia articles is an arduous task that some feel is rather unfair, and now I have experienced this process myself.